Paragliding is a high risk sport and injuries do occur when paragliding, mainly to the lower limb like twisted ankles suffered during take-off or landing. More than 90% of these injuries happen during the first ten flights a pilot makes, the majority of these injuries being to the lower leg. Paragliders aren't cheap. A new model suitable for a recently trained pilot will cost around £2000, although second hand canopies will cost much less. Training at a registered club to a level where you are capable of flying your own canopy costs around £900, with accessories like specialist clothing and safety equipment like a harness, this total cost will rise significantly. At a training school you are taught theory on flight, basic meteorology, basic air law and are set an exam that you need to pass. You are also taught about your canopy, how to use it, what it is capable of and a few short hops will included in the course that normally lasts for around 10 flying days. There is a lot of camaraderie between pilots and very experienced pilots are normally very happy to give advice and swap notes on techniques and safety issues with novices. The learning period is very important so don't be afraid to ask for advice, everyone was a beginner at some time. Paragliding can be made a lot safer if you are aware of your limitations and take into account the weather conditions before launching. So what can you do to make paragliding as safe as possible? Don't try and teach yourself how to paraglide, that can be extremely dangerous. Paragliding is a form of aviation and you'd never think about trying to teach yourself how to fly a jumbo jet…would you? Learn to fly from a fully qualified paragliding instructor. If you are a beginner don't buy second hand equipment, unless it has been seen by your instructor and is deemed suitable. Paragliders are rated on performance. 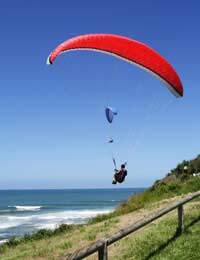 If you join a registered club you will be taught on a paraglider that has been rated for a beginner. Equipment you will need apart from a canopy is a harness, flight suit, boots and a helmet. More advanced pilots may also need navigation instruments and other accessories. Take the weather into account before launching. You don't need a hill to paraglide. You can be launched on the flat by towing, using an engine driven winch. It's important however that you have been trained in the technique of taking off using a tow before attempting it. The tow operator must also have been fully trained. Use caution if you are attempting to fly in weather conditions you have never flown in before. Don't attempt a level of flight that is beyond your level of experience. Never attempt fixed rope towing or tethering, this is extremely dangerous. Use your common sense. Don't take unnecessary risks. Paragliding can be dangerous enough without making rash decisions or judgements. I keep asking advice for over half Century; people in my age group, smart and polite have obviously died out. Undisturbed, they watch pilots die in lock-outs while s simple technology preventing loss of life or limb rests in my drawer. Is this the idea of natural selection where the fittest will survive initial training so the species will improve? the "Inventor For All Seasons'. A reserve-chute is not listed, but is of course a must have part of the standard equipment.